“Remember Goliad!” was the cry of the soldiers at San Jacinto, bespeaking the symbolic role of the events here during the Texas Revolution. In 1836 the Mexican army under Jose de Urrea defeated James W. Fannin’s Goliad command in the Battle of Coleto Creek and, after marching the survivors to nearby La Bahia Presidio, executed more than 400 men, including Fannin. 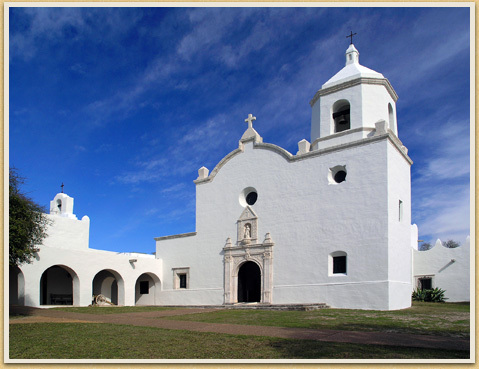 Around the Goliad County area, especially at the nearby Mission Nuestra Señora de Espíritu Santo de Zúñiga, are remnants of the past that continue to have great meaning for many 21st-century Texans. During the 1930s, after research into the history, archeology, and architecture of Spanish missions throughout northern Mexico and Texas, the National Park Service–funded architects Samuel C. P. Vosper, Raiford L. Stripling and Chester Nagel, along with archeologist Roland Beard, launched a reconstruction of the mission structures. They interpreted Spanish design skillfully, if rather freely. With guidance from these park planners CCC Company 3822, comprised entirely of older war veterans, set up camp in the area and focused their efforts on the reconstruction of the 18th-century Spanish Mission Nuestra Señora de Espíritu Santo de Zúñiga, using stone from the site and a nearby quarry to accomplish their work. Under Beard’s direction the men housed the many artifacts unearthed during the archeological investigations in the park’s newly established museum. Vosper and Stripling's subsequent works, including design of the nearby Goliad Memorial Auditorium and the Fannin Battlefield Memorial and both built with Texas Centennial funding, continued to emphasize the area's distinctive historic legacy. Reconstruction: Mission Nuestra Señora de Espíritu Santo de Zúñiga, including the Church, Granary, Cloister, and Workshop. New construction: Museum (currently the park headquarters), Furniture and Decorative Metalwork, Park Road 6, Culverts, Picnic Tables, and the Custodian’s Group. The CCC Latrine is no longer in use. A wooden Entrance Sign no longer exists at the park and a Combination Building was designed but not built.